Mean Bean Games has brought an updated combat system to its mobile tower defense game Forces of Nature, making the game easier to play for new users. 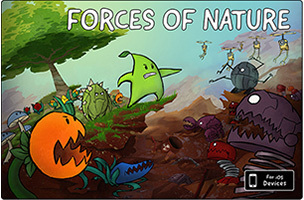 Forces of Nature sees plants taking on robots in a bid for Earth’s survival, as players control a plant named Sprout, who can raise an army of plants to take into battle. In each level of Forces of Nature, players defend the Tree of Life by defeating robotic enemies before they can get close enough to harm it. Each 2D side-scrolling level allows players to move freely throughout the environment, jumping onto or off of platforms along the path. Players earn water droplets automatically over time, which can be spent on new units, healing powers and more. While players must move Sprout close enough to enemies for him to attack, other units will move around the environment and attack automatically. Levels become more complicated and difficult over time, with more enemies to defeat, among other challenges. Each level offers three stars, depending on a player’s performance, encouraging them to go back and earn missed stars along the way. Forces of Nature launched on iOS last fall for $1.99, but has been dropped to $0.99 alongside this update. Outside of the game’s adventure mode, players can truly test their skills in Survival mode, or simply learn more about the game’s fictitious plants in the in-game Almanac. Check back soon to follow Forces of Nature on AppData, our tracking platform for mobile and social apps and developers.